Milwaukee<sup></sup> M12 Realtree Xtra<sup></sup> Camo Heated Hoodie: A versatile heated solution for the outdoorsman, the M12 Cordless Realtree Xtra<sup></sup> Heated Hoodie integrates (3) carbon fiber heating elements between a durable water repellant exterior and waffle-weave thermal liner to distribute and maintain heat across core body areas. An adjustable heat zone that spans the chest and back provides the right amount of heat for any season. In fall and spring months, the M12 Camo Heated Hoodie can be worn as a rugged piece of outerwear. In the harshest winter conditions, it works best as a solitary base layer that allows users to shed bulky undergarments while generating and holding heat close to the body. Featuring special noise-reducing fabric and the Realtree Xtra<sup></sup> Camo pattern, the hoodie provides up to 6 hours of continuous heat per battery charge while utilizing the same M12 REDLITHIUM Battery technology that powers 60+ tools. All M12 Heated Hoodies are washer and dryer safe. Milwaukee<sup></sup> M12 Heated Hoodie: Adding versatility to the Milwaukee<sup></sup> Heated Gear line, M12 Cordless Heated Hoodies integrate (3) carbon fiber heating elements between a durable cotton exterior and waffle-weave thermal liner to distribute and maintain heat across core body areas. An adjustable heat zone that spans the chest and back provides the right amount of heat for any season. In fall and spring months the M12 Heated Hoodie can be worn as a rugged outer layer. In the harshest winter conditions, it works best as a solitary base layer that allows users to shed bulky undergarments while generating and holding heat close to the body. Working on or off the jobsite M12 Heated Hoodies provide up to 6 hours of continuous heat per battery charge to keep you moving without the need for multiple layers to stay warm. The Milwaukee<sup></sup> M12 Heated Hoodie uses the same M12 REDLITHIUM Battery technology that powers 60+ tools. All M12 Heated Hoodies are washer and dryer safe. The M12 Cordless Heated Hoodie from Milwaukee Tool provides up to 6 hours of continuous heat in a rugged jobsite design. This soft but durable cotton blend hoodie provides ample warmth for spring and fall or serves as an extra-warm liner on the harshest winter days. State-of-the-art carbon fiber heating elements provide adjustable warmth to the core body area, while a waffle-weave thermal liner and rib knit cuffs keep the heat in. Best of all, the hoodie is machine washable and dryer safe. Powered by the durable M12 REDLITHIUM Battery, the Cordless Heated Hoodie gives you up to 6 hours of continuous fade-free heat, even in extreme weather conditions. The battery and charger (sold separately) are compatible with more than 55 M12 LITHIUM-ION tools. This hoodie is also available in red, khaki or high-visibility lime, in sizes S-3XL. Milwaukee<sup></sup> M12 Realtree Max-1<sup></sup> Camo Heated Hoodie: A versatile heated solution for the outdoorsman, the M12 Cordless Realtree Max-1<sup></sup> Heated Hoodie integrates (3) carbon fibre heating elements between a durable water repellent exterior and waffle-weave thermal liner to distribute and maintain heat across core body areas. An adjustable heat zone that spans the chest and back provides the right amount of heat for any season. In fall and spring months, the M12 Camo Heated Hoodie can be worn as a rugged piece of outerwear. In the harshest winter conditions, it works best as a solitary base layer that allows users to shed bulky undergarments while generating and holding heat close to the body. Featuring special noise-reducing fabric and the Realtree Max-1<sup></sup> Camo pattern, the hoodie provides up to 6 hours of continuous heat per battery charge while utilizing the same M12 REDLITHIUM Battery technology that powers 60+ tools. All M12 Heated Hoodies are washer and dryer safe. 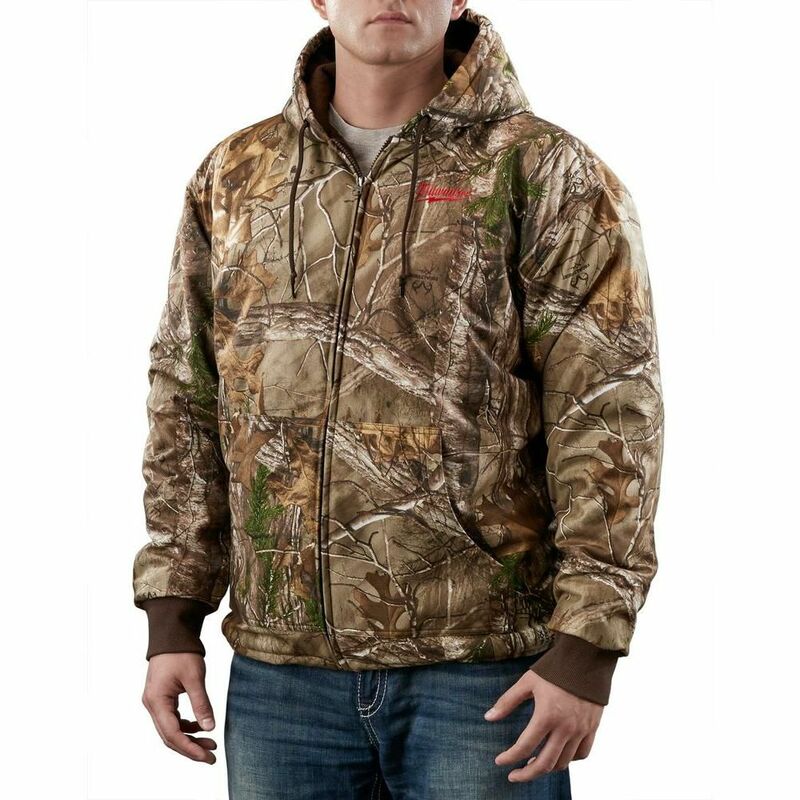 M12 CAMO XTRA HEATED HOODIE W/ BATTERY - XL Milwaukee<sup></sup> M12 Realtree Xtra<sup></sup> Camo Heated Hoodie: A versatile heated solution for the outdoorsman, the M12 Cordless Realtree Xtra<sup></sup> Heated Hoodie integrates (3) carbon fiber heating elements between a durable water repellant exterior and waffle-weave thermal liner to distribute and maintain heat across core body areas. An adjustable heat zone that spans the chest and back provides the right amount of heat for any season. In fall and spring months, the M12 Camo Heated Hoodie can be worn as a rugged piece of outerwear. In the harshest winter conditions, it works best as a solitary base layer that allows users to shed bulky undergarments while generating and holding heat close to the body. Featuring special noise-reducing fabric and the Realtree Xtra<sup></sup> Camo pattern, the hoodie provides up to 6 hours of continuous heat per battery charge while utilizing the same M12 REDLITHIUM Battery technology that powers 60+ tools. All M12 Heated Hoodies are washer and dryer safe. M12 CAMO XTRA HEATED HOODIE W/ BATTERY - XL is rated 5.0 out of 5 by 2. Rated 5 out of 5 by Anonymous from AWESOME JACKET Bought this for a gift. It was perfect and he loves it.